Whether you just need a trim to maintain the health of your hair, or you want to completely transform your hairstyle, Select Salon Dallas can give you the look you desire. If you are unsure exactly what look would best suit you, our stylists can suggest various styles to help you make a decision. 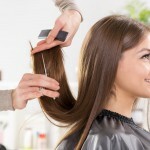 Some people desire a haircut that requires less maintenance, while others do not mind spending extra time for styling. Whatever your preferences may be, we will work with you! A fresh haircut that compliments your facial features an always give a boost of confidence. Contact Select Salon Dallas today!